In public relations, sometimes the stars align and a story just writes itself. 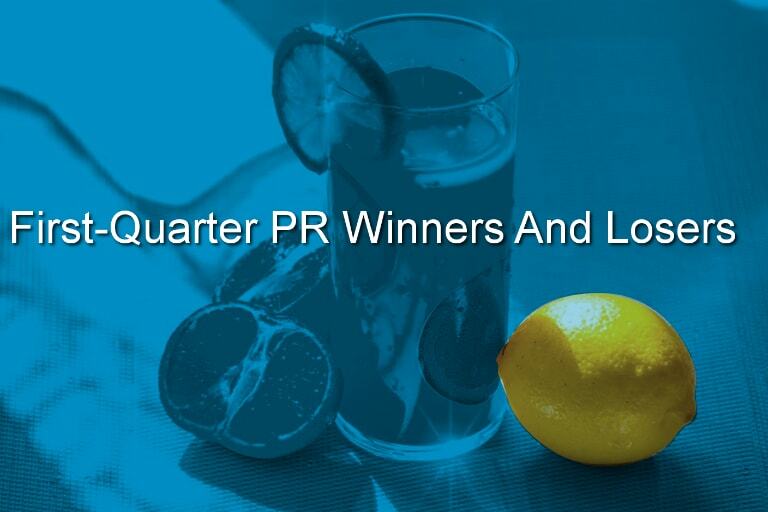 When looking for winners and losers in the realm of public opinion, this past quarter offered a wealth of excellent examples. The criteria for this quarter’s selections are simple enough: the coverage had to be plentiful and broad and the story had to pass the water cooler test. The provocative mix is definitely food for thought for anyone responsible for brand reputation. Fox News. There are two ways to look at recent events at Fox, of course. The Fox News brand has taken some major reputation hits even before the departure of Roger Ailes last summer. Persistent sexual harassment accusations, as well as reports of a workplace culture that covered up and even fostered the behavior, took a toll. The loss of star anchor Megyn Fox was another sign that Fox needed to change. This week, however, when it seemed no one had the stomach to defend Bill O’Reilly against new charges of harassment and racial discrimination, the network took the high road and fired its most popular host. The Murdoch sons, who reportedly made the final decision to let O’Reilly go, (influenced by their wives, according to some reports), made the move under duress, given the number of advertisers who left the show, but we still give them credit for doing the right thing. S-Town Podcast. “Serial” is back! All you have to do is google it to get an idea of the massive hit this quirky radio story has become since its release in March. With little fanfare, the podcast from the “This American Life” and “Serial” crew dropped and took people by surprise with its wry, yet loving take on life and death in a small southern town. In public relations, the term “storytelling” has been co-opted to describe a kind of ideal standard for engaging blog posts and other content. Sometimes PR achieves that, but this one is also the real deal. Anyone aspiring to tell a good story would be wise to settle in with the seven episodes of S-Town. Lyft. Quietly toiling in the shadow of Uber, Lyft has celebrated some major successes in the last couple of months. While Uber has become the Goofus of the industry, Lyft is emerging as the Gallant. Uber’s CEO has been called out for his fights with drivers, sexual harassment at Uber’s corporate offices and a certain resistance to providing a simple way for its customers to tip drivers. Lyft on the other hand, recently celebrated an extra three percent bump in users and high marks in a recent customer survey. Its drivers have also made over $200 million in tips. That milestone is also forcing Uber to add a tipping feature for its drivers as well. We love a story where the nice guys don’t always finish last — or where there’s on the defensive for a moment. United. United’s PR debacle has already been reported on ad nauseum, but it’s valuable to revisit the takeaways for other corporations and business leaders. After bungling its initial apology by being legalistic and defensive, the company promised to review policies and never to repeat its mistake. People Magazine reports that airline staff are querying passengers at check-in on their willingness to be bumped if necessary, which is a move in the right direction. And it appears that the entire industry and the flying public will ultimately win as a result of United’s missteps, as it forced a hard look at airline overbooking practices and even the industry consolidation that has fostered the overreach. Perhaps United can take some solace in a recent poll that found Americans like United Airlines more than our current president. Hmmm. Sean Spicer. It’s almost too easy to single out Spicer for his many mishaps; the Hitler and Holocaust faux pas are just the latest. Anyone can make a verbal stumble, but where Spicer erred was in the multiple “clarifications” of his statement insisting that Hitler’s actions were not quite as bad as those of Syrian president Bashar al-Assad. They only deepened the hole he dug for himself. It would have been far better to simply apologize and admit that the comparison made no sense and was offensive to boot. Of course, that happened in the end, but like the CEO of United Airlines, Spicer made it hard for himself. And when will people learn to stay far away from any comparisons to Nazi Germany? It is media and politcal kryptonite. Spicer has a hugely challenging job, no doubt, but he might benefit from some media training, a dose of humility, and possibly a history lesson. Facebook. Can you think of anything worse for Facebook than the fact that there’s a deceased murderer called the “Facebook Killer?” The fact that a deranged person posted video of his crime is horrifying enough, but it seems that despite protestations to the contrary, it took Facebook a full three hours to flag the video and remove it, which is entirely unacceptable. Clearly the world’s leading social media platform must ensure that, if the worst happens and someone commits a crime on live video, it can act faster. So far Facebook’s Mark Zuckerberg has responded to the situation, saying, “We have a lot of work…we will keep doing all we can to prevent tragedies like this from happening.” That’s a good start, but this is Facebook. How could it could NOT have considered the possibility of something like this after it launched Facebook Live? There surely was some kind of plan in place. By the same token, Facebook needs to communicate more clearly about its content flagging and reporting process and possibly invest in more human monitors as well as the artificial intelligence that it uses to flag pornographic or copyrighted content. The Facebook debate overall is really about the company admitting it’s not just a technology business and accepting responsibility for its role as our largest media and content platform. Since the “fake news” scandals of 2016, a debate about Facebook’s role and its responsibilities has reached a new level, and it’s one that won’t end any time soon.